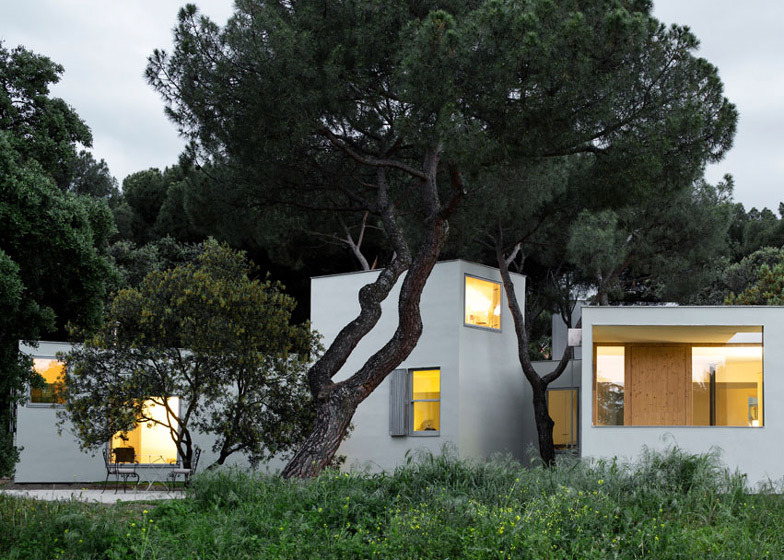 Not wanting to disrupt a beautiful forest on the site, architecture firm FRPO built this wooden house, located near Madrid, with angled walls and open outdoor spaces so the trees become an architectural element in and of themselves. This could potentially lead to interiors that feel disjointed, but a taller central volume with a spiral staircase ascending to the upper floors serves as the heart of the home with corridors leading off to the master bedroom and kids’ rooms at one end, and the kitchen, dining area and living room at the other. The high variety of angles in the joints of the home could have had a negative impact on its energy performance, so the architects chose light, thermally favorable materials like cross-laminated wood panels to boost insulation without adding too much weight. The result is ‘wood in the woods,’ a residence that feels grounded in its natural setting and sheltered within the branches of the trees, yet maintaining a light footprint.